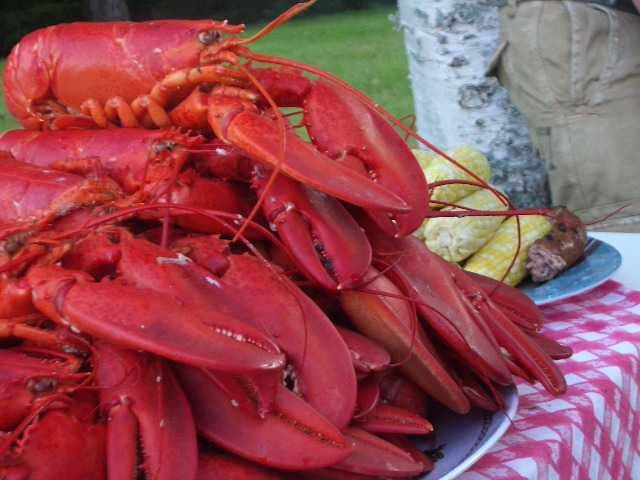 A good lobster dinner in Maine isn’t really a recipe, it’s more of an experience. First, you get two huge lobster pots: One for the lobsters, and the other for the corn. (And in our case, sausage, too.) 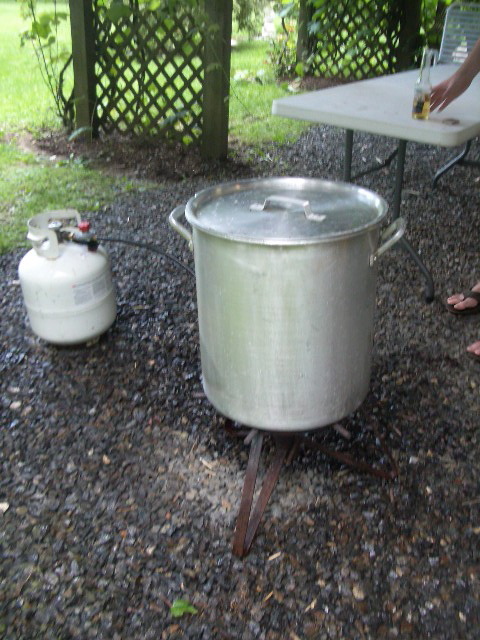 Hook each pot up to a propane burner. 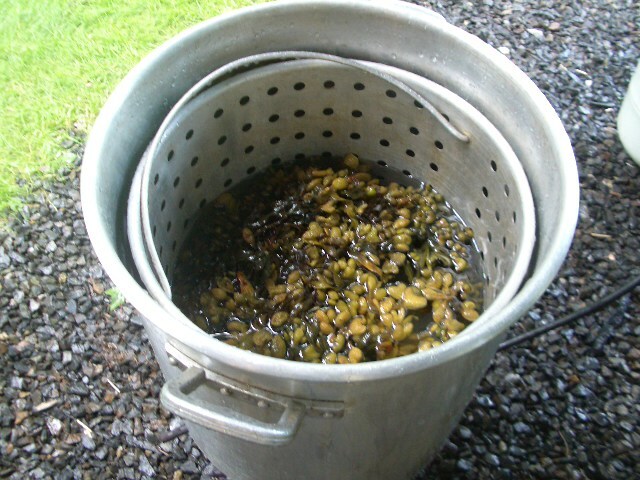 Now that you’ve got your lobster pot out, you need to fill it with water, about 1/3 to 1/2 way full. Then, go down to the rocky coast and get some seaweed. Get a few bunches and put that in the pot as well. Turn the propane on and get the water boiling. 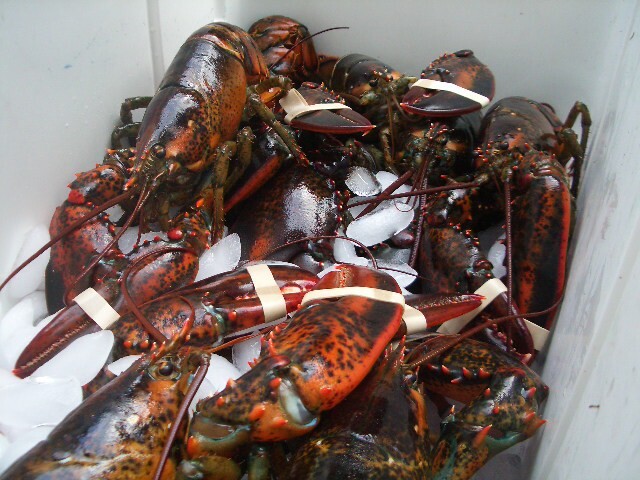 While you’re waiting on the water, go over to the cooler and see how your lobsters are doing. A local lobsterman caught ours just a few hours before this process, and so they were nice and feisty- this is exactly how you want them to be. 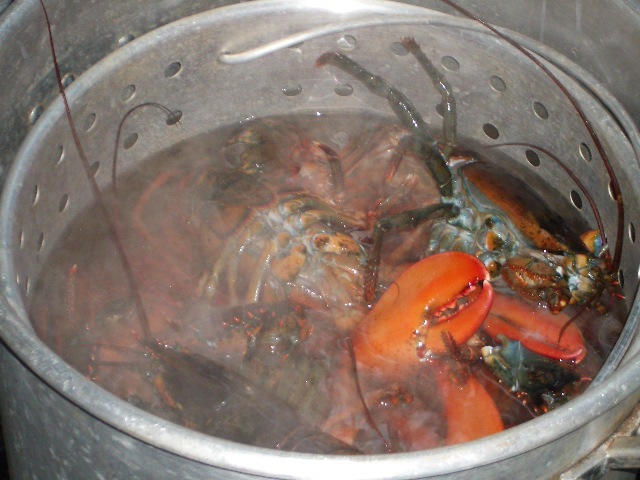 The lobsters need to boil for about 15 minutes. You’ll notice that when they’re alive and when they just start to boil, the color is not yet that characteristic red that we automatically think of when we picture lobsters. You’ll get that beautiful red color when they’re cooked. By the way, if you’re also having corn and sausage, that should cook at the same time the lobsters are cooking in the other pot. 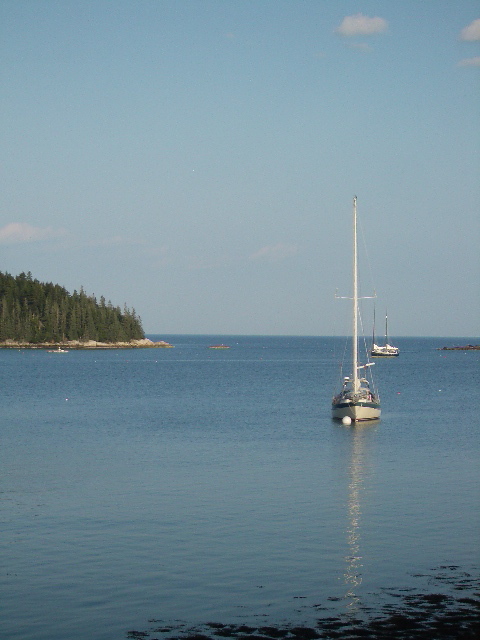 While you were admiring the scenery, the lobsters finished cooking- hooray! 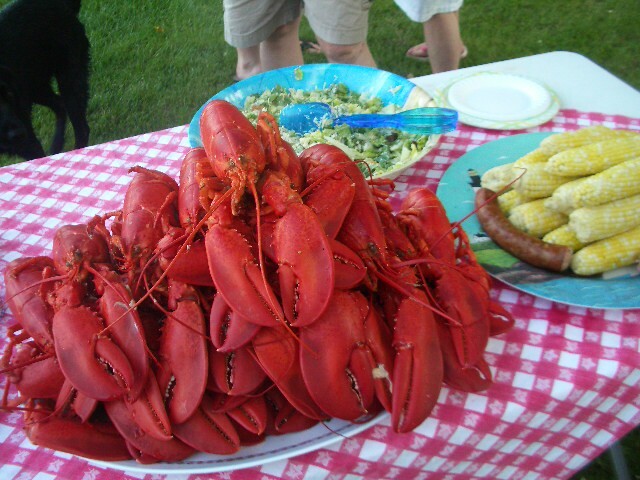 Now, stack them on a platter and bring them over to the picnic table that you have set up by the water. Dive in! We portioned two lobsters for each person, which was more than enough. Everyone has their own philosophy about which part has the best meat and exactly how to go about eating it. 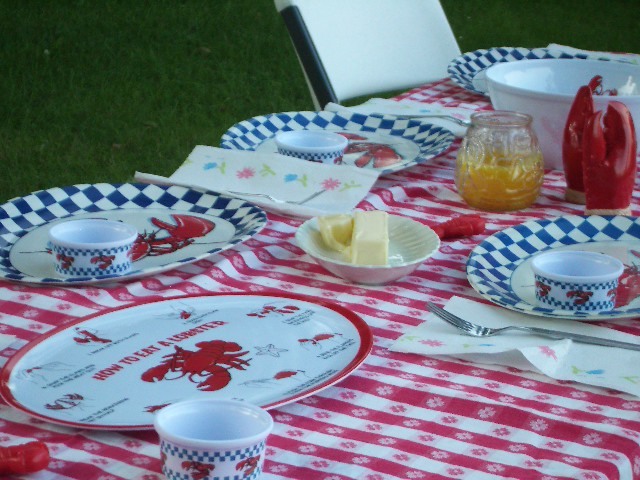 (As you can see, even the plates will give you suggestions…) If it’s your first lobster, sit next to a real Mainer and they can show you how it’s done. Dipping each bite in the little container of butter that sits next to you is always a good idea. 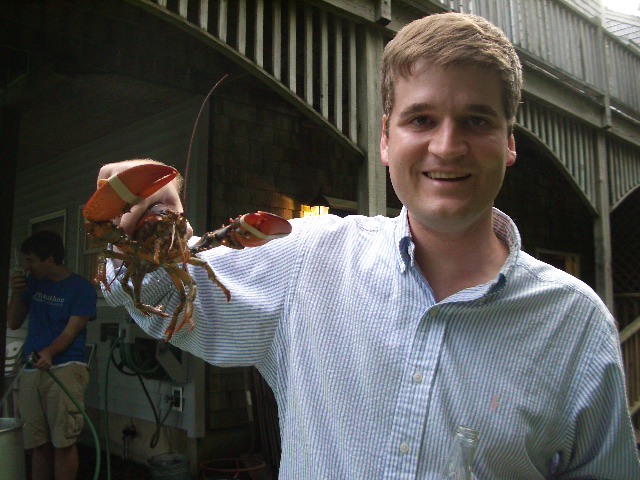 When the Mainer you’re sitting next to recommends that you eat the green-looking stuff from the inside of the lobster’s body cavity, trust them. It’s delicious. This is called the tamale, and Cousin Bert said it’s the liver- it’s got a rich, decadent flavor, and is perfect when spread on some crusty bread. 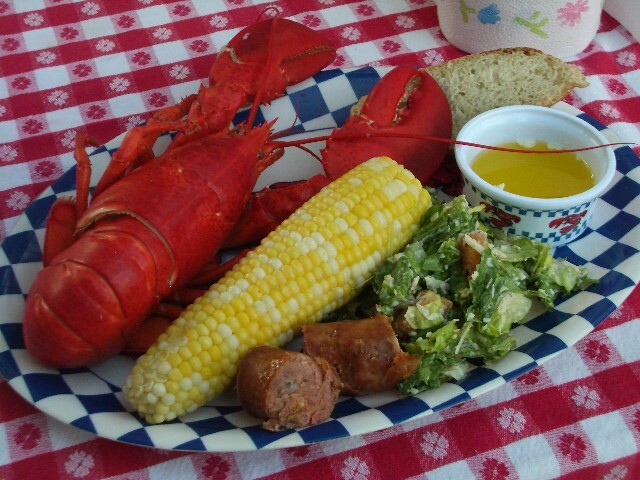 We mentioned the corn and sausage as great accompaniements to the lobster. The corn is the traditional side for this dinner. 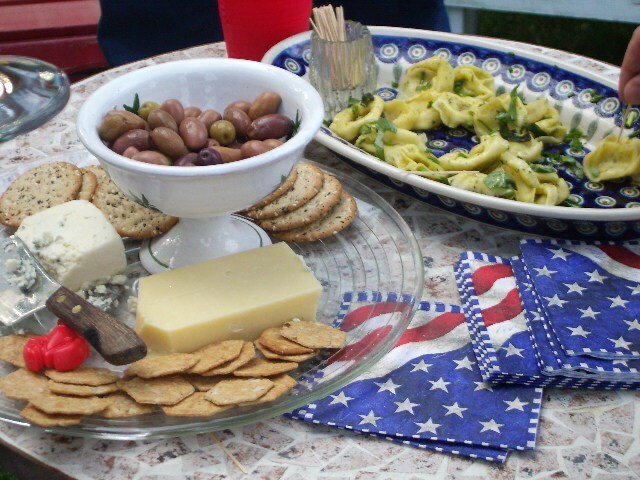 We added the sausage because not only were we on the coast of Maine, but we were eating with the president of the best catering service in New Orleans, LA, John Rowland. John brought along some crawfish and green onion sausage that was amazing. He was also responsible for the delicious caesar salad. Thanks so much to Uncle Dave and Aunt Carol, Chefs Bert and Landon, John, Ahma, and Mom and Dad- what an incredible dinner! Sorry, I forgot to add my name to my previous reply! Thanks for the kudos! 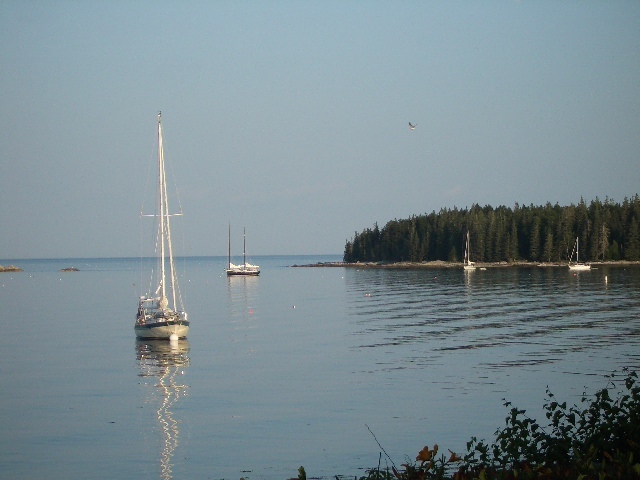 I really enjoyed spending time in Maine with y’all. Congrats on a very well done website. if you ever need any authentic creole or cajun recipies, please let me know. That would be a wonderful experience. I’m adding it to my long-term to-do list.